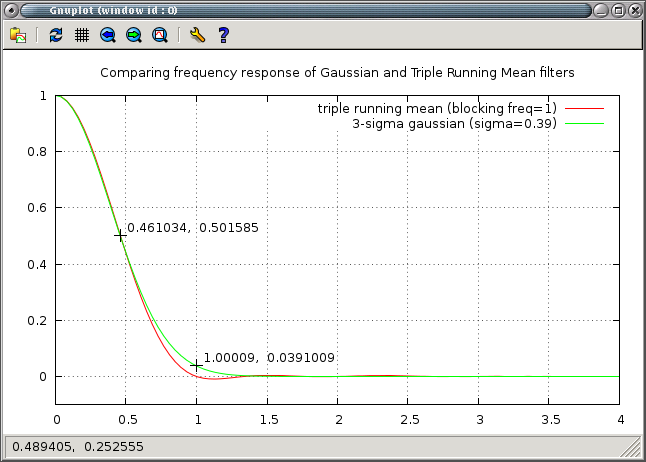 The triple running mean filter has a frequency response very close to that of a 3-sigma gaussian with sigma to 0.39 times the blocking frequency of the RM. The factor of 0.39 makes the full-width-half-height similar for both filters. The gaussian is never exactly zero and lets through about 4% of the signal at the frequency which the running mean blocks totally. The triple running mean has slight negative leakage (inverts signal) of about 1% and very small ripple at higher frequencies. Which filter is most suitable will depend on the application. Also see article on problems of using simple running mean.